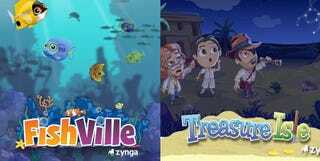 Last month Zynga revealed that 13 of its lesser-performing Facebook games would be closed in order to make the social side of the company less of a massive disappointment. Yesterday players of FishVille and Treasure Isle were informed that those games would be closing up shop on December 5. What, there was a FishVille? Not only was there a FishVille, Zynga refers to people playing the game as Fishvillers, wish isn't something I could see myself ever wanting to be called. Players of both games are eligible for a bonus package if they move to one of Zynga's less dead-in-the-water titles. Thank you for supporting FishVille and for being a loyal player! We're sorry to inform you that FishVille will be shutting down on December 5, 2012. In place of FishVille, we encourage you to play other Zynga games like Castleville, Chefville, Farmville 2, Mafia Wars and Yoville. We appreciate your participation in FishVille as it helped make the game a fun place to meet with friends. As a loyal FishVille player, you are eligible for a one-time, complimentary bonus package in one of either Castleville, or Chefville, or Farmville 2, or Mafia Wars or Yoville. You can start the process by clicking the Redeem button in game when you log in. Please note that this offer will be valid only until December 5, 2012. Thank you for your time in FishVille. We look forward to seeing you again in other Zynga games.